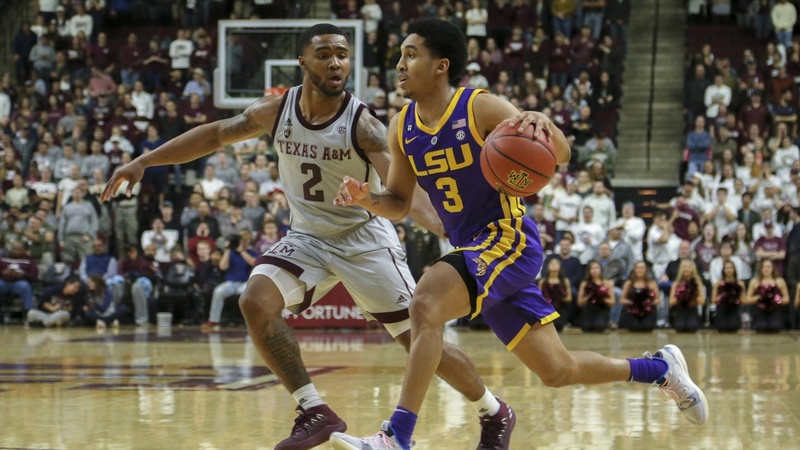 Tremont Waters scored a season-high 36 points to carry LSU to a 72-57 Southeastern Conference victory against Texas A&M at Reed Arena in College Station on Wednesday night. Even though Waters scored 36 points, Naz Reid and Kavell Bigby-Williams led the way when the Tigers took control of the game early in the second half. Holding a 37-36 advantage, LSU outscored the Aggies 14-4 in the first five-plus minutes after halftime. Reid scored seven points on two foul shots, a field goal and a three-point play. Bigby-Williams scored five points on a field goal and a three-point play. The other two points came on free throws by Waters. Neither Reid nor Bigby-Williams scored in the first half. Texas A&M, which came no closer than five points over the final 15 minutes, missed four of its six field goal attempts and committed four turnovers in this span. Waters scored his most points against a SEC opponent. His previous high was 28 points against Vanderbilt and Mississippi State last season. Waters was 11-of-18 from the field, including 6-of-10 on 3-pointers. The six 3-pointers were a career-high. Waters made all eight of his foul shots. The eight made free throws were his season-high. Waters scored 23 of LSU’s 37 first-half points. He also grabbed a season-high seven rebounds. Waters’ career-high in points is 39 against Marquette last season. He also had three steals. LSU’s starting lineup consisted of Bigby-Williams and Reid in the post, Skylar Mays and Taylor on the wings and Waters at point guard. All five starters played at least 26 minutes. Waters was the only Tigers player to be on the court for more than 30 minutes. He played 34 minutes. . .Days had a very productive night by getting his nine points and eight rebounds in just 15 minutes. Days was 4-of-7 from the field. Days had scored only eight points in the previous five games. . .Reid missed nine of his 11 field goal attempts. . .Bigby-Williams, who was 3-of-4 from the field, blocked three shots. He has double-digit rebounds in four of the seven SEC games. . .After scoring a career-high 24 against Missouri, Mays made one basket – on an uncontested layup late in the game. Mays, who had a team-high four assists, missed his first nine field goal attempts. He was 0-for-7 on 3-point shots. . .Both Taylor and Javonte Smart had problems making shots. Taylor was 3-of-10 from the field, while Smart made just two of his seven field goal attempts. Neither Taylor nor Smart made a 3-point shot. . .Emmitt Williams had no points and one rebound in 11 minutes. . .Flagg, who was averaging 13 points and eight rebounds for the Aggies, finished with seven points and seven boards. . .LSU built a seven-point lead at 33-26 late in the first half. Texas A&M outscored the Tigers 10-4 over the last three minutes before halftime. . .The Aggies cut their deficit to five points at 56-51 with 9:40 remaining in the game. A 3-pointer by Days and a basket by Smart pushed LSU’s lead back to 10 points at 61-51. Texas A&M scored just six points over the final 9:40. . .LSU is 17-3 overall, 7-0 in the SEC. The last time the Tigers had a better record after 20 games occurred in 1981 when they started the season at 19-1. LSU has won its first seven SEC games for the first time since 2006. . .The Tigers extended their winning streak to 10 games – their longest since 2009 when they also won ten games in a row. . .LSU has won four consecutive SEC road games for the first time since 2009 when they registered six straight SEC victories away from the PMAC. . .The Tigers moved back into a tie with Tennessee for first place in the SEC standings. . .Texas A&M is 8-11 overall, 1-6 in the SEC. . .The paid attendance was 6,554. LSU will play host to Arkansas at the PMAC on Saturday. Tipoff is scheduled for 5 p.m. Central. The Razorbacks (12-8, 3-4) defeated Georgia 70-60 in Fayetteville on Tuesday night. The LSU-Arkansas game will be available on the SEC Network.